Instead, they're holding onto the eighth and final playoff berth in the Western Conference and within reach of a higher seed. "The roster changes definitely helped us in many ways," said rookie Shai Gilgeous-Alexander, who scored on back-to-back layups when the Clippers led by four points with 2 1/2 minutes to go and the shot clock winding down. "The clock gave me no choice," he said. "I just wanted to be aggressive and make something happen." 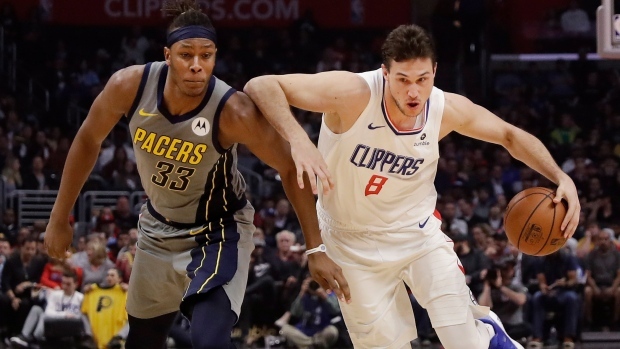 Bogdanovic slipped again on the Pacers' final possession and they failed to score over the final 33 seconds. "Just not enough," Indiana coach Nate McMillan said. "We've got to get sharper with our execution, got to get stronger with the basketball. Got to make plays. We've got to make our breaks." "These teams are good teams, playoff teams," Pacers guard Wesley Matthews said. "They are what we are gearing ourselves up for and we have to do a better job." The Clippers led by 17 early in the fourth only to see the Pacers close within five. Gallinari re-entered the game and promptly hit a 3-pointer that ended Indiana's 16-7 run. Beverley made a 3-pointer and Gallinari and Gilgeous-Alexander combined to make four straight free throws that extended the Clippers' lead to 106-97. Pacers: G Darren Collison (right quad contusion) missed his first game of the season after starting the previous 71. ... It's their longest road losing streak since dropping eight in a row from March 6-April 2, 2017. ... They had won five in a row against the Clippers. Rivers denied rumours before the game that he's interested in leaving to coach the Lakers. Rivers and Clippers owner Steve Ballmer agreed to a shorter contract extension last year that included an opt-out after this season. However, Rivers said that's being replaced with a long-term deal. "Straight and upfront, I'm going to be here until Steve says 'Get out,'" he said. "It's the West. You let down, you're out." — Rivers.